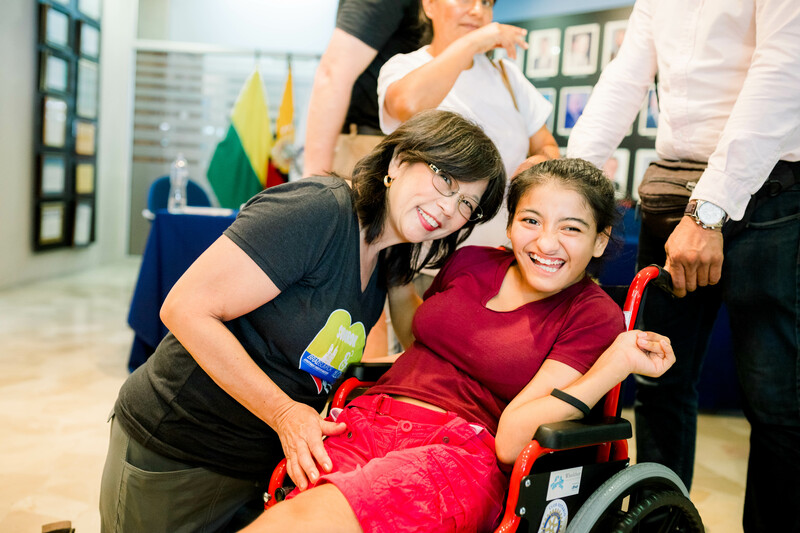 This past January, NuView executives, Glen Mather and Jason DeBono, with their wives Loida and Christina, joined Brad and Jen Sumrok’s group of nearly 25 people to travel to Ecuador, for a Chair the Love wheelchair distribution. The group worked closely with the local Rotary Club, and through them, was able to find and distribute 280 wheelchairs to those in need in Guayaquil and surrounding towns. Many of the people that received wheelchairs depend on their family members to carry them from place to place, while some have never even been able to leave their homes because of the lack of mobility options. Because of this distribution, 280 people – both children and adults alike – are now able to move freely and comfortably. In addition to distributing wheelchairs, the entire group was able to get a tour of the town and even visit a local k-8 school that the local Rotarians fund. Brad and Jen were so inspired by the school and the children that attended, they challenged the group to raise the remaining funds needed to finish a current expansion project to add 9th-12th grades to the school. Within a week, the Brad Sumrok Apartment Investment Mastery students stepped up in a big way, coupled with the Sumrok’s generous matching donation, along with a match from NuView Trust Company, to raise enough funds to finish the project! This endeavor will now allow the students to enjoy a full education through 12th grade at this wonderful school and provide graduates with significant opportunities otherwise not afforded to them. The school addition is set to be complete at the end of April, just in time for the new school year! If you’d like to get involved or learn more about this wonderful organization, visit www.chairthelove.org or contact us at bwelch@nuviewira.com. We’d love to talk to you about the charity, upcoming events and what you’re able to do in your community to help.